The photos above show: A Memory Map front cover; the 'chapters' on the inside flap; and how the map looks when opened up. 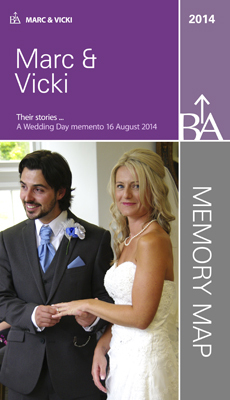 Chart your favourite moments in your very own Memory Map© ...10 memories, captured forever in stunning and unique style. They could be 10 important moments in your life, or, if you're a sportsman, they could be the 10 best goals you've ever scored or the 10 best innings you've ever hit. In fact, your Memory Map can be about anything you want. It would make a unique memento of your wedding day - why not have a ‘his and hers’ potted life story in a Wedding Day Memory Map? It can be a pre-wedding story to be gifted on the day, or a post-wedding gift to include pictures and words from the day. Ever wondered what to give as a christening or anniversary present? Or as a leaving gift to a colleague? Here's your answer! Or perhaps you'd like one for your pet? Their story in words and pictures! 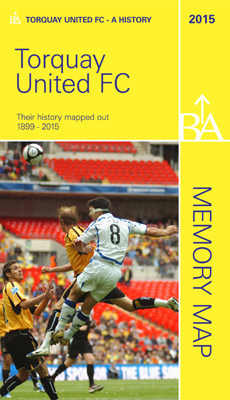 A Brilliant Memory Map is also a fabulous way to present the story of a place, business or club - such as the one I have written about Torquay United Football Club, available direct from me, price £4.99 plus £2 p&p. Telephone 01752 295944 or email me here to find out how to order your copy. It's also on sale at Amazon. 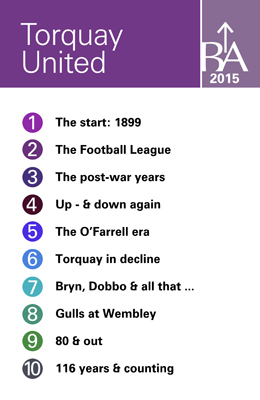 Torquay United FC - Their History Mapped Out, published by Brilliant Autobiographies, ISBN number 978-0-9931883-0-5. If you manage an organisation or a local tourism information centre for example, ring me for a chat about how a local history can be produced for promotional purposes or for retail. In 2016, I completed a Memory Map for the BBC to mark the official opening by HRH the Duchess of Cornwall of their refurbished South West HQ in Plymouth. 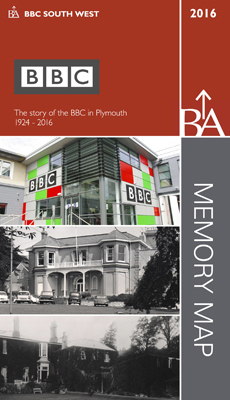 A copy of the map, detailing the history of the BBC in Plymouth, was given to the Duchess. The map is exactly that: it has a glossy cover and back, and opens and folds, just like a map. There are 10 panels above the half-way fold, five along and two down, and exactly the same beneath the half-way fold. 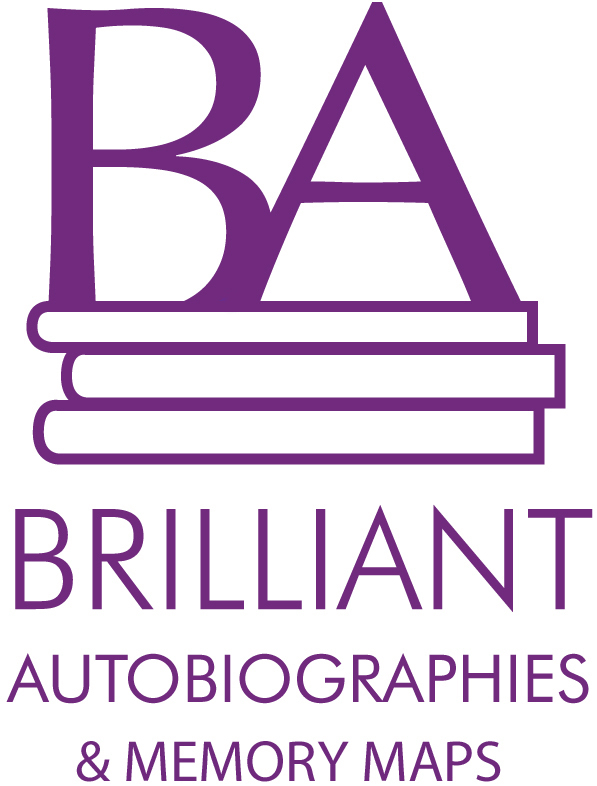 For commissioned life stories, I interview you - in person preferably or over the phone - and write the text (or you may even want to provide the text yourself). You provide the images to include and within 10 to 14 days, your Memory Map is ready! When opened up, the map measures approximately 90cm deep by 63cm wide. The design work is by award-winning graphic designer Mark Hannon. 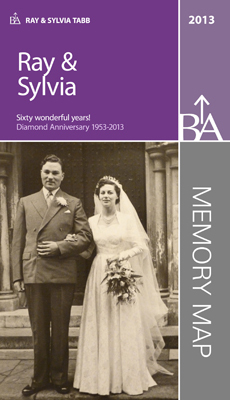 The Memory Maps are printed by specialist map printers in the South West of England. Prices for life story commissions: Packages start at £500 for five copies; 10 copies are £575; 20 copies are £650. The cost covers the work and time involved in writing and designing your map and the printing costs. The more copies you order, the more economical each map is. Quotes can be provided for bulk orders. 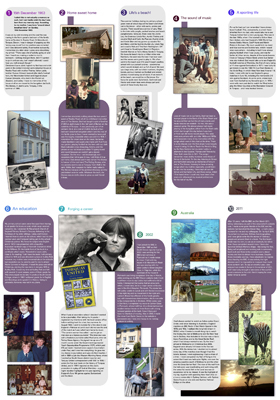 For those wanting local history commissions, get in touch to see how a Memory Map can work for you.